I felt asleep when I watched Shrek the Third which was a disappointment to me and my wife. It was one of our first free screening as my friend was working in Astro then. We actually were half asleep when we exit the movie theater. I did not felt like that at all when I watch Shrek Forever After or Shrek 4. It was in 3-D and it was so good that there was a few 'in-joke' which really tickled me and even though some were not laughing, I did. It was a movie for adult who has the kid still lurking within him or her. If you have kids all around, why complain as movies with talking ogre, talking donkey, a mean gingerbread man and a lying Pinocchio is as much as for adult who understand the ridiculousness of its all but is also for kids who just wanna watch a cartoon movie. In short, it was a good movie. I watched it with my staff. We have movie nights now at the office. So, Shrek Forever After was our choice for May 2010. 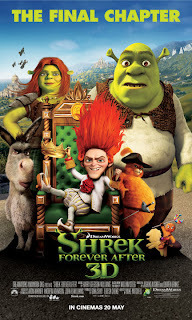 After enjoying the Shrek 4-D ride in Universal Studio in Singapore, I consider it as a great 3D movie. My advice is, go watch it and go watch it in 3D. The 'Do the Roar' kid was totally epic lah..haha! I saw this movie yesterday, and I loved it. Most of the 3D movies have an option for either 3D or not. I always choose 3D. After liking the first Shrek movie very much, I always make sure I go see any Shrek movie. Your movie nights are a very good idea.